Dear Readers, rhubarb is something of a travelling plant in our family. I remember a patch of it growing in the two allotments that we had when I was a child, and I strongly suspect that it was the same plant, dug up and transplanted. And now that Mum and Dad live in their Dorset bungalow there is a clump of the plant growing next to the greenhouse. How handsome it is, with its crinkly green leaves that look in need of a good iron, and those lip-puckering stalks, so unpromising raw, so delicious when combined with some sugar and topped with crumble. However, rhubarb is truly a divisive, love-it-or-hate-it plant. I find that people who love it often also favour other strong, uncompromising flavours, such as gooseberries,mackerel, blackcurrants and offal. It is a most assertive ingredient, and needs to be treated with the utmost respect by the cook. In the first months of a new year there is forced rhubarb, with its yellow leaves and delicate rose-pink stems. 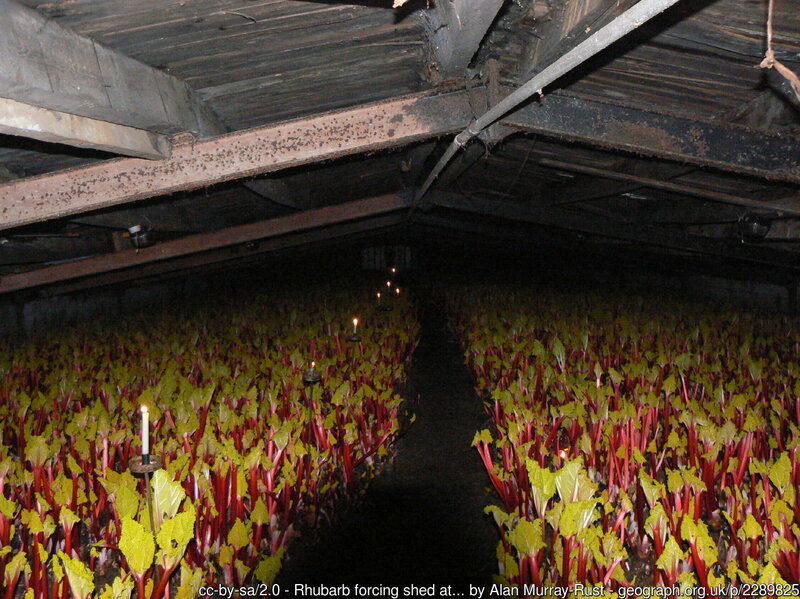 In the UK this is grown in sheds in the ‘rhubarb triangle’ (between Wakefield, Leeds and Morley) and is picked by candlelight, in a tradition dating back to the 1800’s. The plants are grown outside for two years (and therefore exposed to frost, which is said to improve the flavour) and are then moved to low, heated sheds – the plants used to be fertilised with manure, night-soil and ‘shoddy’, a by-product of the wool industry. At one time, West Yorkshire produced 90% of all the forced rhubarb in the world, Such was the demand that the ‘Rhubarb Express’ brought up to 200 tonnes of rhubarb to the south every day before 1939. Alas, the post-war availability of more exotic fruits impacted on the rhubarb trade, and today the early rhubarb is an expensive luxury – beautiful, delicate, and, to my mind, more insipid than the robust late-spring outdoor-grown plant. But what a treat it must have been before everything was available all the time! We have lost something, I feel, with our strawberries in December and our asparagus in October and our oranges all year round. But the ‘real’ stuff comes later in the year, with green and red-tinged stems and with a tannic taste that can twist the face into some most amusing shapes. It cooks in seconds, and the stems collapse into mush at the slightest provocation, so if presentation is a concern, keep your eye on your rhubarb. Usually, though, the fruit is covered with a pie crust, or sponge, or the aforementioned crumble, and so appearance is not a major concern. 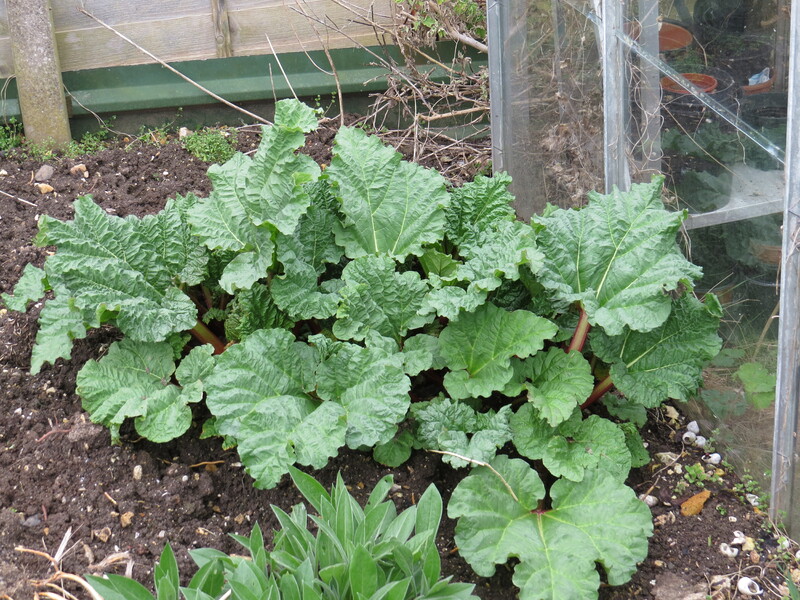 I have been seeing some recipes which use young rhubarb raw in salads, and very pretty they look too. Those crinkly leaves are poisonous, containing oxalic acid which is a corrosive ingredient that acts particularly on the kidneys. 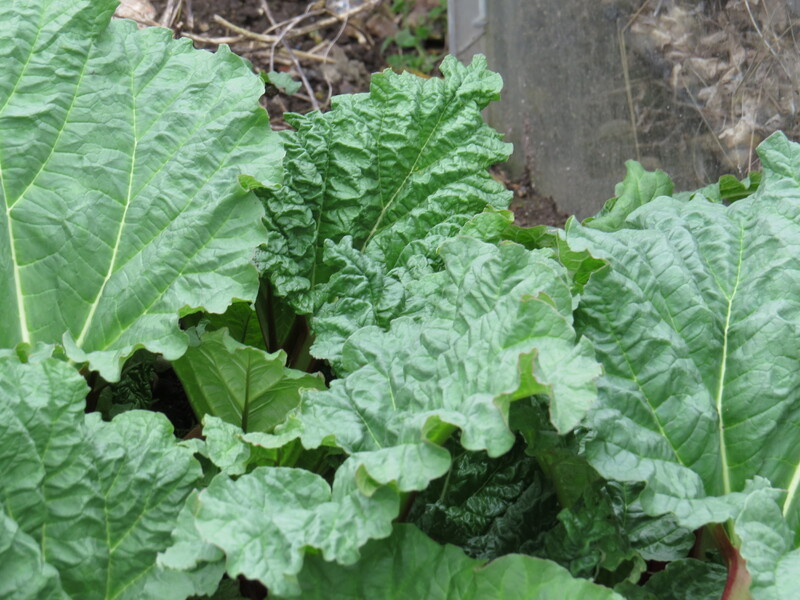 It is estimated that 5 kgs of rhubarb leaves would have to be ingested to run the risk of dying from rhubarb poisoning, but there is also a school of thought that suggests that using bicarbonate of soda in the cooking water ( a common technique for keeping the bright colour of leafy greens) accentuates the toxin. There is also a long-standing belief amongst scientists that there is another, unidentified toxin in the rhubarb leaves. During the First World War there were said to be a few cases of accidental poisoning when people harvested and cooked the leaves, but it seems to be hard to find hard evidence for such cases. What is much better documented is the long history of rhubarb being used as a laxative – the Chinese have used it for this purpose for millenia, as did the medieval peoples of Western Europe and the Middle East. 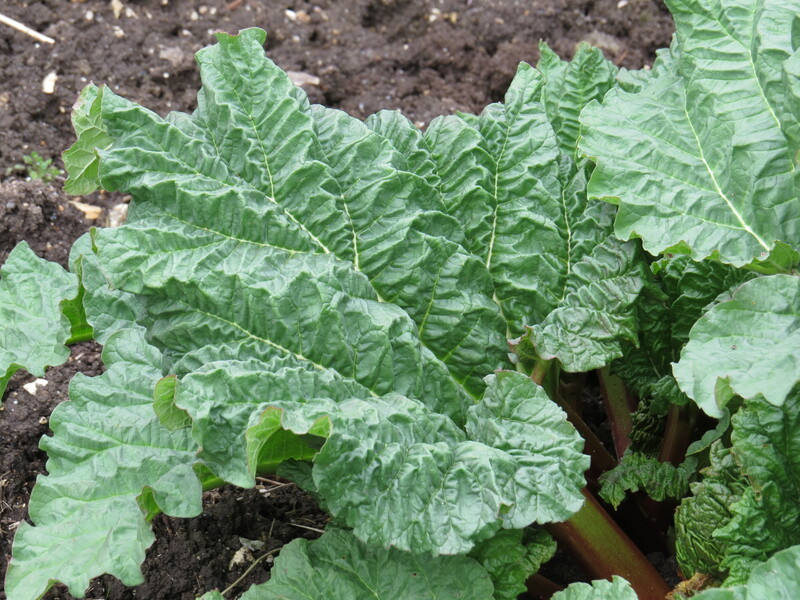 Along with senna pods rhubarb was one of the ‘comedy ingredients’ of my childhood – it would be clear that anyone eating rhubarb without the traditional sweet accoutrements was constipated. A good old purge was often thought to sort everything out, and rhubarb was just the stuff to do it. But of course this is a most adaptable plant, and it took to the soils of Europe with much enthusiasm. 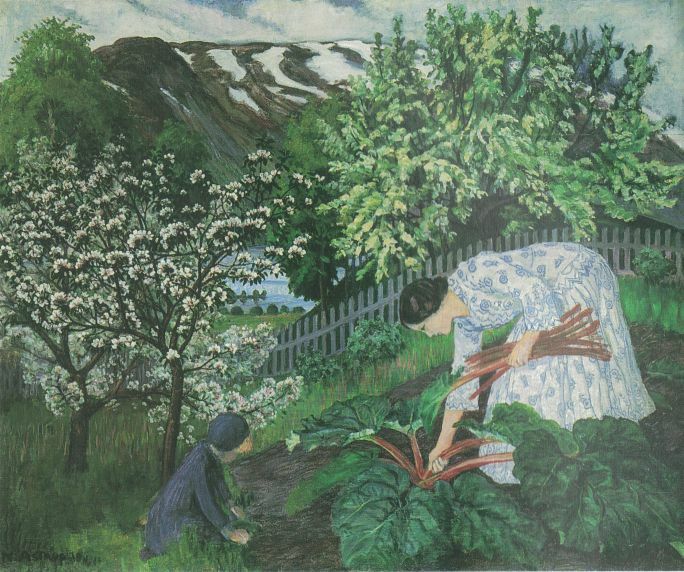 Soon every peasant had a rhubarb plant of his or her own, and the ingredient was being used in every kitchen. Rhubarb isn’t technically a fruit, as the stems are used rather than the fruiting bodies (just as a tomato is a fruit, not a vegetable). I doubt that that has dampened anyone’s enthusiasm, however. Part of the joy of harvesting a (small amount) of rhubarb is that you head out with your machete, cut off the stems while imaging that there’s a leopard in the undergrowth waiting to pounce on you (or maybe that’s just me) and return to the house with your booty. None of that time-consuming picking! Rhubarb is definitely an ingredient for the ‘I want it now’ generation. You can have a pot full of rhubarb compote in less than twenty minutes from opening the back door. 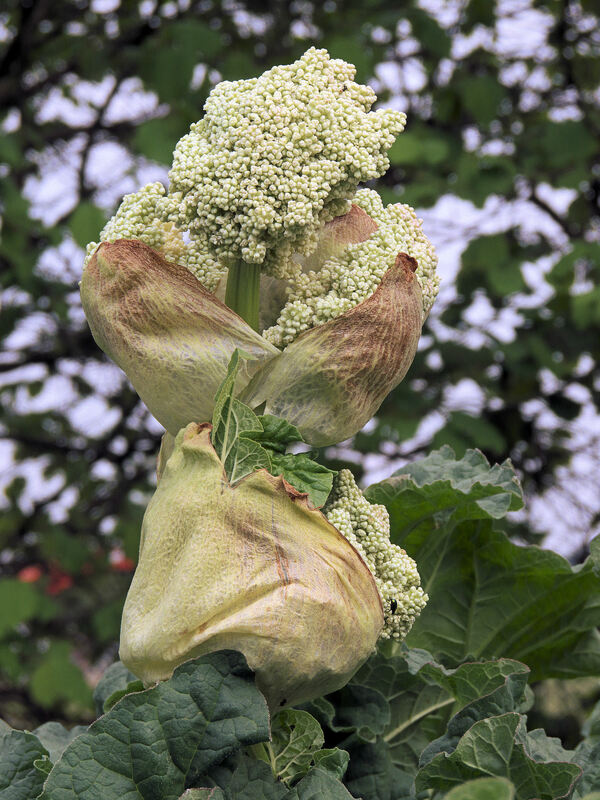 Incidentally, I have never seen a rhubarb plant in flower, but this is what it looks like. 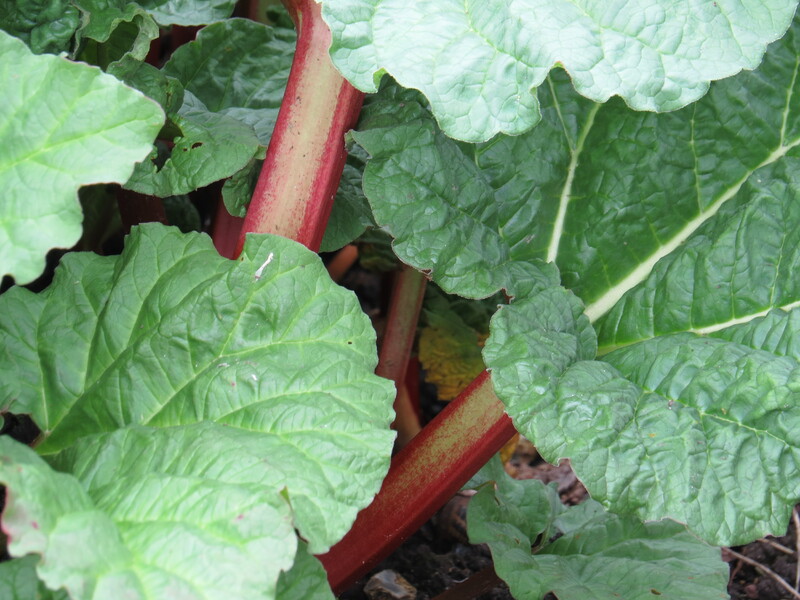 Rhubarb is a member of the Polygonaceae, which includes buckwheat, the various persicarias, sorrel and Japanese knotweed. If you look closely at the white florets, they look rather like buckwheat. Rhubarb is great for bringing back the shine to burnt pots and pans. I must remember this time next time I forget about my rhubarb compote and boil it dry. The leaves can be used as an insecticide (all that oxalic acid, I’m guessing) – boil up in water, allow to cool, spray, watch all the aphids retreat screaming, clutching their babies under their arms (not that I’m trying to make anyone feel guilty of course). But now we come to a most puzzling question. Why is the phrase ‘rhubarb, rhubarb’ used to simulate the sound of background chatting in plays and films? Allegedly it’s because the word contains no particularly obvious phonemes, and so if a lot of people are repeating it, in different tones and with different stresses, it sounds a lot like your usual background babble. Other phrases might include ‘watermelon’ and ‘peas and carrots’. Apparently, however, these days what is more often used is something called ‘pocket dialogue’ – a few uncompleted sentences relating to the matter at hand for the extras to say, to simulate the sound of conversation. What a shame. I rather liked the idea of everyone saying rhubarb. Though maybe it stimulated the appetite for a coffee break. And here, finally, is a rather fine poem about rhubarb, and about lots of other things too…. who couldn’t find it in themselves to dig. that you knew life was hard work if you did it right. So she grew more than the whole family could eat. into my thumb knuckle at first swipe. We ate the rhubarb raw, stripped of all its leaves. against the worst of what was yet to come. Photo One by © Copyright Alan Murray-Rust and licensed for reuse under this Creative Commons Licence. This entry was posted in London Plants on April 25, 2018 by Bug Woman. In your research did you find out what helps it to grow? We planted some in our garden some years ago but it just withered away. We thought it might have been the (1400m) altitude but there is a huge clump/copse nearby where the stalks are like small tree trunks and the leaves must be a metre square (well sort of triangular anyway). Whoever owns the garden doesn’t crop it and so it goes to seed/flower every year. Such a waste! My Grandmother grew rhubarb and made the best pie from it! My favoured way of eating it, as a child, was to dip it in sugar and bite the end off and chew. I also loved raw Gooseberries and cooking Apples. I don’t think that I wold be so sanguine nowadays! What an excellent weed! I grow the same rhubarb that I got from my great grandfather before I was in kindergarten! The tip about cleaning pans etc is spot on. Cooking apples work in the same way; best with the peel left on. Granny and mum passed on this knowledge to me, bless them.